Enjoyable climate in the attic during summer period and protection against the sun, as well as heat are guaranteed by external awning blind Roto Screen ZAR. It is made of fibreglass covered with plastic and thanks to that, it’s possible to stop approx. 70% of the thermal radiation, which in effect does not reach the external glass. Awning blind Roto Screen ZAR is recommended in combination with internal accessories, e.g. blackout blind Roto ZRV. 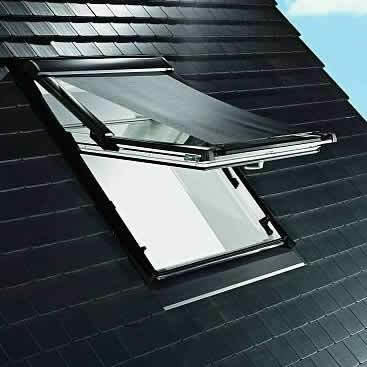 Such set is able to provide protection against the heat and it allows to additionally darken the room. Mesh material of the awning blind Roto Screen ZAR is made of fibreglass in grey colour. Important: External awning blinds Roto Screen ZAR do not have blackout properties. If you are interested in the total blackout, here you will find genuine blackout blinds Roto. External awning blinds Roto Screen ZAR fit to all models of the Roto roof windows, except for the Ecoline/Colt series (first digits from Roto window code: 320- or 33- or 52- or 53-). If you are unsure the size or series of your Roto window, please send us a picture of Roto loft window code on email: roto@roluxshop.com.